The botanical name for the coconut is cocos nucifera, with cocos believed to come from Spanish, meaning “monkey-faced” or “eerie-faced” and nucifera from Latin meaning nut-bearing plant (from fero = I bear and nux-nucis = nut). It’s nut, perhaps bearing three germinating pores, resembles a monkey face.The coconut palm, has been eulogised as “Kalpavriksha” (Vriksha means Tree in Malayalam), the all giving tree in the classics of India. Its fruit is called “Lakshmi Phal” which is used in most of the social and religious functions in India from Kashmir to Kanyakumari, irrespective of whether the palm is grown locally or not. The use of coconut through out India makes it a symbol of national unity and perhaps in the olden times the people of our country or our ancestors might have migrated from a coconut growing area. It is also possible that coconut had been cultivated in many parts of India and the climatic and geographical changes in due course might have caused the confinement of coconut to coastal tracts in the country. The coconut palm is a long-lived plant; it has a single trunk, 20-30 metre tall, its bark is smooth and gray, marked by ringed scars left by fallen leaf bases. 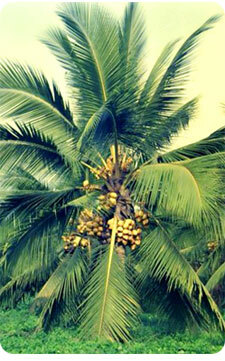 The tree can live as long as 100 years producing an annual yield of 50 to 100 coconuts. Coconut palms are found throughout the tropics, and can also be successfully grown in areas that receive only mild frosts. 90% of the world’s coconut production for exports, sources from the Asia-Pacific region, though coconut products are an increasing source of revenues for many other developing areas. The coconut palm is perhaps the widest-grown palm in the world, coconuts feature as one of the main sources of income for producing countries, in that a large number of different products utilized and appreciated in the western countries as well are made out of them. Besides drink, food and shade, coconut tree offers the possibilities of housing, thatching, hats, baskets, furniture, mats, cordage, clothing, charcoal, brooms, fans, ornaments, musical instruments, shampoo, containers, implements and oil for fuel, light, ointments, soap, and more. Its leaves are used to make baskets, roofing thatch etc., apical buds of adult plants are an excellent palm-cabbage, an alcoholic drink known as Toddy or palm wine is extracted from its sugar sap, tapped from the inflorescence by means of apposite cuttings. The tree is considered the most useful tree in the tropics because it provides everything needed to sustain life – The Kalpa Vriksha! Coconuts are the fruit of the coconut palm tree, which originated in Southeast Asia, and was transported throughout the Pacific either by migrating Indonesians and Polynesians or on the drifting ocean currents. 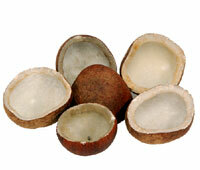 Coconuts are used as whole fruits or, conversely, by their parts: mesocarp fibers, milk, kernel (or flesh), husk. Its fruit, as big as a man’s head and 1-2 kg in weight, is a drupe with a thin, smooth, grey-brown epicarp, a fibrous, 4-8 cm thick, mesocarp and a woody endocarp; as it is rather light, it can be carried long distances by water while keeping its germinability for a long time. Inside it contains one seed, rich in reserve substances located in the endosperm, which is partly liquid (coconut milk), partly solid (flesh). When its embryo germinates, its radical breaks through one of the three germinating pores, visible from the outside as well. Coconuts will remain fresh for several months, making them ideal for shipping around the world and into your supermarket. The fruit should feel heavy, heavier than it looks, and when shaken, you should hear the water sloshing around inside. 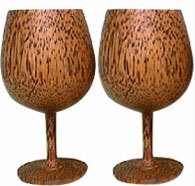 Avoid fruit with cracks in the shell or any evidence of dampness or mold, especially around the “eyes” of the coconut. The biggest challenge for most of us is opening the coconut! A hammer is actually not the best tool, so get a screwdriver out of the tool chest, and a rubber mallet or something similar (a rock will work). Please don’t waste that water inside! Drink it or use it to make a wonderful, melt in your mouth pudding. More importantly, it’s used in the manufacture of such diverse products as soap, lubricants, explosives and margarine. The thick outer husk is a source of a tough fiber called coir used to make doormats and brushes. 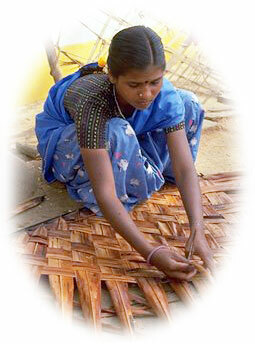 The leaves are used in some areas for roofing thatch and basket weaving. 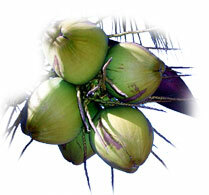 Most of us in the U.S. are familiar with the coconut palm from resorts in Florida and the Caribbean. Since falling coconuts can pose a serious (sometimes fatal!) health hazard to guests, they are sometimes removed by resort managers hoping to avoid lawsuits. Copra is the meat of the coconut and in shredded form probably the most familiar to those who do not live in the tropics. It is an oil-rich pulp with a very light, slightly sweet and nutty flavor. As with most fruits, it’s best eaten fresh, but does preserve very well in dried and frozen form, and both the oil and the milk derived from the copra have long shelf lives. The oil extracted from the copra (Coconut Oil) has been the subject of intense debate as to its nutritional value or harm, though value seems to have won out over a scare that may have been launched by the competition. As a “functional food,” coconut oil is now being recognized by the medical community as a powerful tool against immune diseases. Several studies have been done on its effectiveness, and much research is currently being done on the incredible nutritional value of pure coconut oil. Coconut Water and Coconut Milk are not the same thing. The lightly flavored liquid inside a coconut is water and is typically drunk straight from the coconut for a very refreshing and nutritious drink. It loses nutritional value quickly and will begin to ferment once removed from the shell. Coconut milk is made from shredded or grated coconut pulp mixed with hot water to extract the oils and flavors. The former is quite welcome after a hot, dusty hike or too much time in the sun, and the later is used in cooking and as a replacement for cow’s milk. A cold-sterilization process is being explored that would permit the bottling of fresh coconut water for sale as an energy drink.